TOGA Leadership Leading members of the Tidewater Oyster Gardeners Association paused for a picture during a recent refresher course at VIMS. From L: TOGA President David Turney; President Emeritus Jackie Partin; past presidents Ray Hook, Chan Chandler, and Vic Spain; and Vice President Brian Wood. Photo by David Malmquist. Refresher Course VIMS-TOGA liaison Karen Hudson speaks to TOGA members during the refresher course for master oyster gardeners at VIMS. Photo by David Malmquist. MOG Training TOGA members Rolf Zierow, Elaine Tait, and John Partin take part in the master oyster gardener training course at VIMS. Photo courtesy of Vic Spain. Measuring Osyters TOGA member Sammie Joplin of Hampton measures oysters. Photo courtesy of Vic Spain. A recent gathering of “Master Oyster Gardeners” at the Virginia Institute of Marine Science is the latest chapter in a fruitful partnership between VIMS scientists and members of the Tidewater Oyster Gardeners Association, or TOGA. 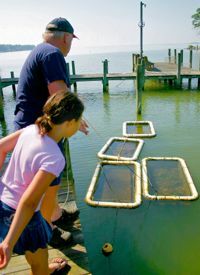 The citizen-led group, incorporated as a non-profit in 1997, builds on groundbreaking advances in oyster-growing techniques developed by professor Mark Luckenbach and colleagues at VIMS in the early 1990s. The VIMS-TOGA partnership continues today through regular one-on-one interactions and an annual series of alternating training and refresher courses. Karen Hudson, an extension specialist for the Virginia Sea Grant Marine Extension Program at VIMS and the current TOGA liaison, describes the relationship as “a great example of researchers and citizens working together to restore and enhance our living resources.” She estimates that local gardeners have around two million oysters in Bay waters at any one time. During this year’s refresher course, a subset of TOGA members—those who have earned designation as Master Oyster Gardeners, or “MOGs”—met with scientists from VIMS, the Virginia Department of Health, and the Virginia Marine Resources Commission to learn about the latest in oyster science and Bay ecology. The MOGS are now back in their own waterfront neighborhoods, sharing their newfound knowledge and motivating others to enjoy oyster gardening too. Mike Oesterling, the original VIMS-TOGA liaison, developed the first MOG course in 1998 and conducted the subsequent courses until his retirement in 2011. He credits a trio of TOGA members—Jackie Partin, Leslie Bowie, and Lyn Layer—with coming up with the idea of a Master Oyster Gardener, patterned after a similar program for master vegetable and flower gardeners run by the U.S. Department of Agriculture’s Cooperative Extension Service. VIMS’ MOG training course, now held every other year, teaches the fundamentals of oyster gardening, including lessons on oyster biology and ecology, gear selection, animal husbandry, permitting, and shellfish sanitation. A session with staff from the Aquaculture Genetics and Breeding Technology Center at VIMS introduces the students to selective breeding, stock selection, and seed selection. “ABC” has developed the disease-tolerant strains that dominate oyster gardening and commercial farming in the Bay, and is now working to improve oyster growth, meat yield, and hatchery traits. 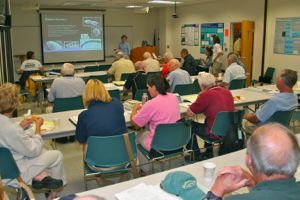 In years such as 2012 when the two-day training course isn’t offered, previously trained MOGs are invited back to VIMS for a one-day session that highlights recent advances and concerns in oyster culture. These refreshers courses have proven very popular, attracting about half of current MOGs. Partin, a TOGA founder and past president, notes that as of June, there are 88 MOGs among the TOGA membership, which currently exceeds 500 active participants. That’s a far cry from the 20 gardeners in the association during its first year. Partin arrived in Tidewater in the mid-1990s, when continuing declines in water quality and the abundance of oysters and other marine life were just beginning to galvanize grass-roots movements to restore the health of Chesapeake Bay. Partin says that meeting, organized by oyster-gardening pioneer Don Beard, was the spark that led to TOGA’s creation the following year. 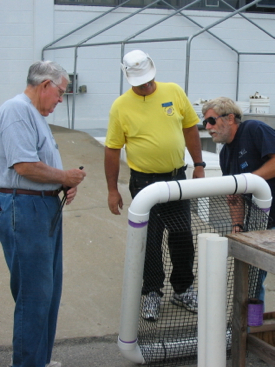 Beard, who passed away this June, became interested in oyster gardening in the early 1990s while pursuing a VIMS-led project to evaluate the feasibility of small-scale oyster aquaculture. Beard eventually suggested that the Partins, Bowie, Layer, and other Middle Peninsula oyster gardeners start a group of their own, providing the impetus for the incorporation of TOGA. Early events included a float-building workshop hosted by Jim Wesson of the Virginia Marine Resources Commission and VIMS alumnus Tommy Leggett. The VIMS-TOGA partnership has now come full circle, with TOGA establishing an endowment in the VIMS Foundation to support research by graduate students in the College of William and Mary’s School of Marine Science at VIMS. TOGA launched the fellowship endowment in 2011 with an initial gift of $27,000, and reached the full endowment milestone in April 2012 when contributions from some 90 donors brought the TOGA Fellowship Endowment to $51,500. Student support from the endowment will begin later this year.